I'm Here. I'm Queer. What the Hell do I read? : This was going to be Hope Part 3 - but, scratch that. Kris Allen wins American Idol. This was going to be Hope Part 3 - but, scratch that. Kris Allen wins American Idol. Ryan Seacrest: How does it feel? 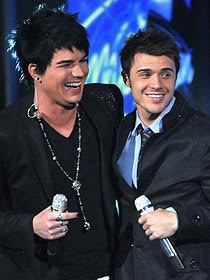 Kris Allen: It feels good, man, but um, Adam deserves this. Oh, America. What the Hell? Kris is cute and a good singer, but Adam is a star and an AMAZING SINGER! I guess the best revenge will be that Adam will end up being the biggest star that was ever on American Idol. And I'll be first in line to download all his songs! I guess we'll get back to "Hope" tomorrow. I want to just get this question out of the way first, something that's been dangling a bit over you for the whole season: Would you like to put to rest all the speculation about your sexuality? So you don't want to say anything one way or the other? BTW, enjoyed the Schmooze the other night. Thanks for going to the trouble. I've been struggling with this all day. Um, "speculation" is a newer word for "closet," isn't it? I don't find closets very interesting. I certainly don't find the people in closets to be very very interesting. I'm so disappointed it's hard to express. I wrote this on some AI blog where no one will read it, but here at least you will. Early on we get into the phrase "this is a singing competition," which the judges say all the time, and we start to forget that yes, it is a singing competition, but an American Idol branded singing competition. It's not literally about the best singer in America. If it was, opera singers would come in and sweep up with the most vocal skills. The song written as the first single has all the information you need to understand how Kris won. AI wants a winner to "fit" that song. (Okay the key was high for him, but they'll change that. I'm talking about the kind of song it is.) Last year the song "fit" Cook better. The Blake year, the song was a total mess for him. He lost. The Fantasia year, the song couldn't have been written more with her in mind. The song defines the kind of contestant they want to win. I think America got it right. Kris is a better American Idol. Adam will go on to have an amazing career with more control about his personal and artistic choices. To me, it's great that we've grown so much in our musical appreciation and acceptance that Adam made it so far in the competition and will go on with a huge fan base. Win/win as I see it. thanks for your kind and calm perspective. But I'm feeling more upbeat... and I think I get can back to "hope" posts tomorrow! Glad to help. And the fact that the "speculation" comment gets to you makes my point for me. I'm willing to bet that he can't say anything while he's under AI contract. I kept thinking you were wrong, Lee, that America wouldn't be that STUPID - and, yet, my AOL headline is "America not ready for Adam's guyliner"
SERIOUSLY? David Bowie, Billy Idol, for pete frickin' sakes the Jonas boys wear it on stage and we can't handle makeup on men? I agree with a couple comments here - about Kris being more the "AI brand"and the very real possibility of Adam being contractually barred from saying, "Yes, I'm gay" to the media. He seems to get little "acknowledgments" in whenever he can - like in an interview w/Fox 11 news when he spoke about the honor of performing with Queen and how inspiring Freddy Mercury was to him...he said, "Freddy's talent...HIS STORY..." with a significant emphasis on "story" -as if he was saying "ou know what I mean." I agree with a number of the comments here - about Kris being more the "AI brand"and the very real possibility of Adam being contractually barred from saying, "Yes, I'm gay" to the media. He seems to get little "acknowledgments" in whenever he can - like in an interview w/Fox 11 news when he spoke about the honor of performing with Queen and how inspiring Freddy Mercury was to him...he said, "Freddy's talent...HIS STORY..." w/an emphasis on story in a "you know what I mean" kind of way. Empirically, Adam was the superior singer. Unfortunately, the system of voting is undemocratic, so who knows what the "truth" is? The only reason I watched it is because of you! Ugh.